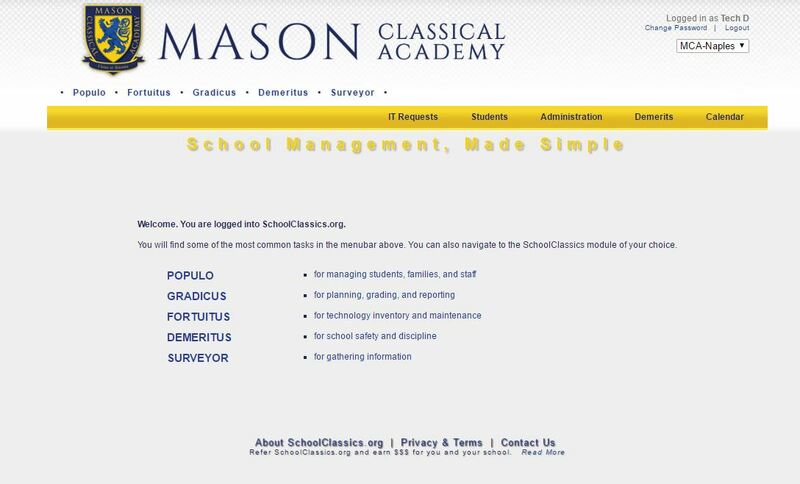 This slideshow highlights just some of the key features of SchoolClassics.org. If you would like a more in-depth demonstration using a remote video connection, please contact support@schoolclassics.org. 1. Getting Started: SchoolClassics.org has five modules. The most important are Gradicus and Populo. These are used most often. Note how the site is customized with the logo and colors of your school. 2. Dashboard - Calendar: The teacher's dashboard displays the school calendar at the very top, including important dates, events, and student/staff birthdays. Clicking on a student enlarges their picture. 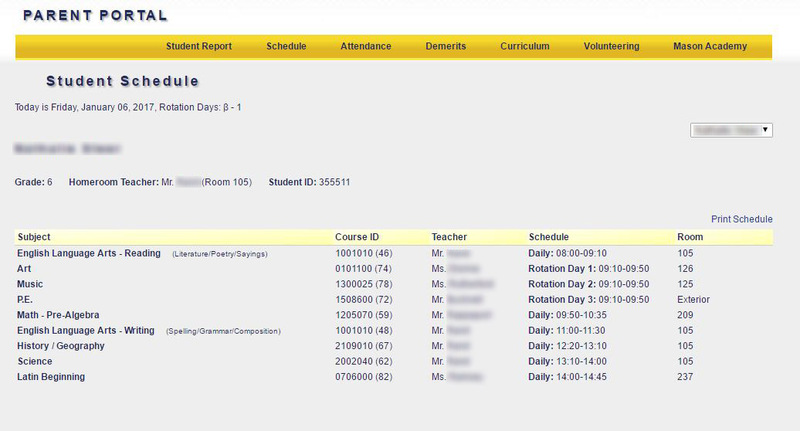 Notice that Gradicus allows for class rotation days in the schedule. Days can be labeled by numbers, letters, or even Greek letters. 3. 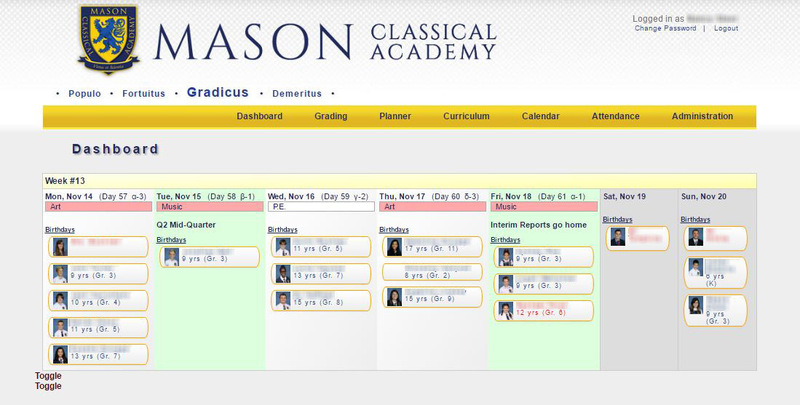 Dashboard - Attendance: Attendance is recorded directly in the teachers' dashboard. Schools may choose to also have teachers record students' after-school plans, whether they be carline, a club, or a sport. Default student plans can be set to save time. 4. Dashboard - Class Summary: The teacher dashboard has a class summary with quick links to important pages such as grading, planning, class reports, and rosters (which can be exported to spreadsheets). Average class grades that are either too high or too low are highlighted (optional parameters set by administration), as are classes with missing grades. 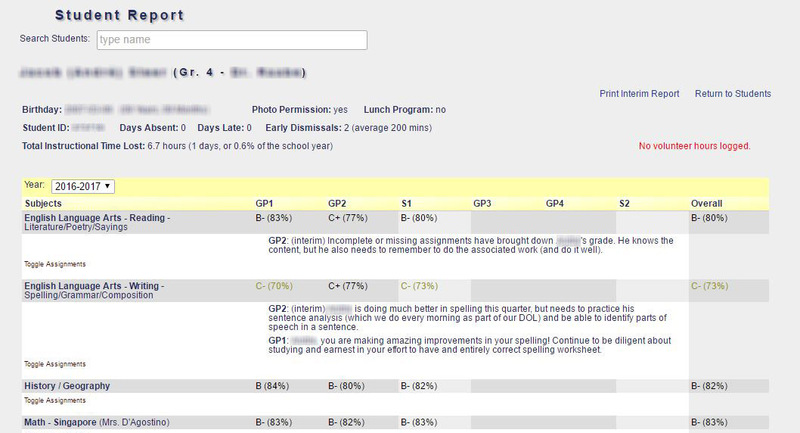 Missing student grades are displayed right in the dashboard to make it easy for teachers to follow up. A click of a button sends a notification email about missing assignments directly to the parents. 5. 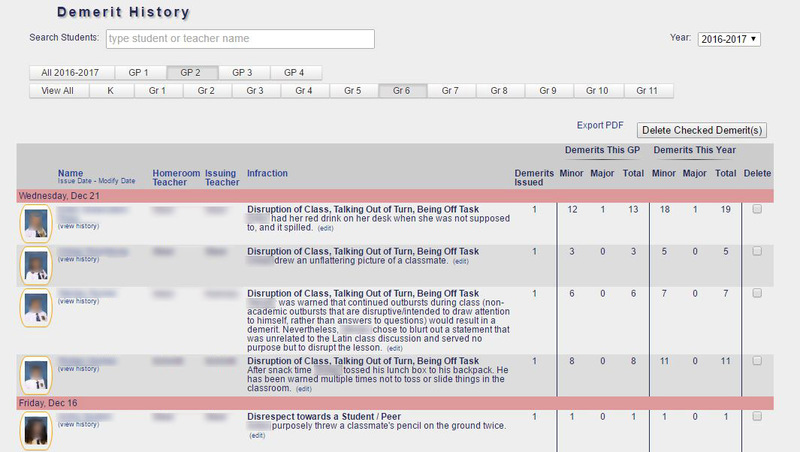 Dashboard - Detentions: If Demeritus is used by the school, students with detentions will show up on the dashboard as a reminder for teachers to follow up. As detentions are served, they can be checked off in this display. 6. Admin Dashboard - Attendance History: This graphic gives you a quick overview of the attendance trends at the school. You can easily see if there are, say, too many absences on Fridays, or if there is a flu passing through the school. 7. Admin Dashboard - Too High or Too Low: Administrators have access to this list of classes where the averages grades may be too high or too low. The grades may be perfectly valid, but this tool is an excellent check to see if the course content and assessment is too easy or too hard for the students. It also helps prevent artificial grade inflation. 8. 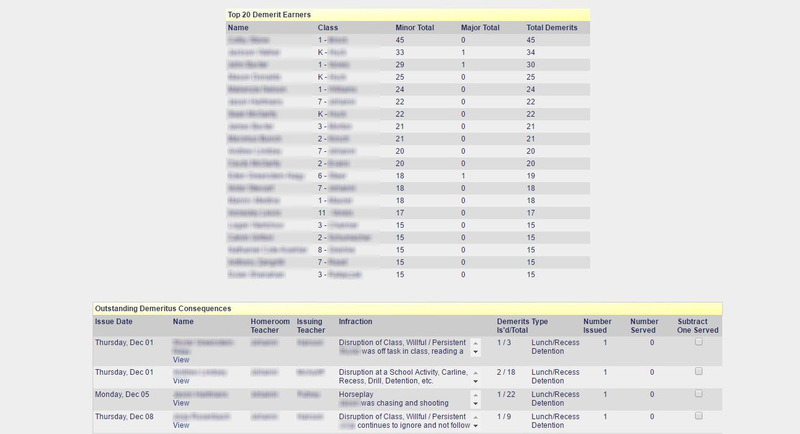 Admin Dashboard - Top 20 Demerit Earners: If Demeritus is used, the top 20 demerit earning studenst are displayed on the administration dashboard. Within days of the start of the school, administrators can identify those students who will need intervention strategies in order to have a successful year. The progress of the students' behavior can then be monitored easily and closely on a daily basis. 9. 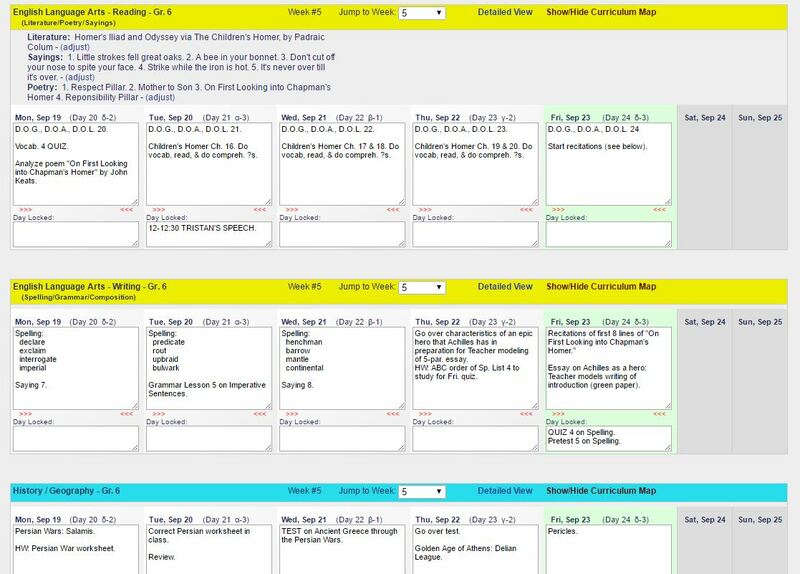 Planning - Curriculum: The curriculum map for each course is accessible by all teachers and administrators. Only administrators and teachers of that course can make modifications. The curriculum map is standardized in a monthly format or as a syllabus. They can be exported to a PDF. Parents can view the curricula through the Parent Portal (optional). 10. Planning - Classes: Class planning can be done in two modes. This is the multiview mode, where all the teacher's classes are displayed on a single page as a quick overview of the entire day. The curriculum map can be toggled open to show where in the plans the class should be that week. This view can be printed out as a PDF for convenience. 11. 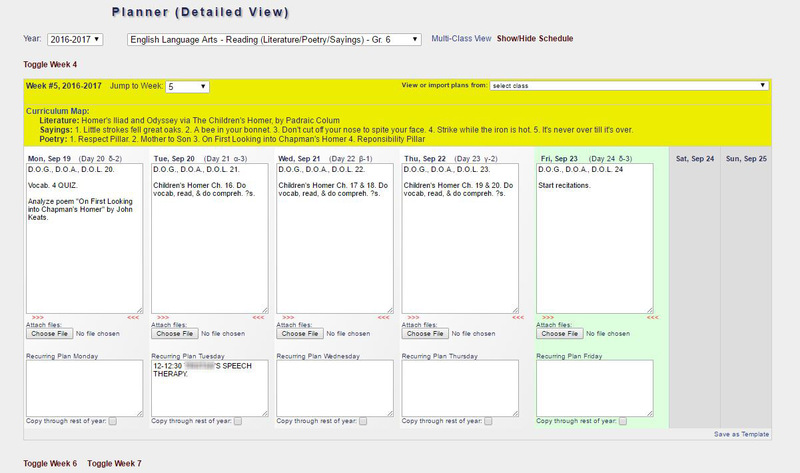 Planning - Classes: This is the detailed class-planning view. This displays one class at a time, but with more options, including the ability to view and import plans from other teachers, classes, or a teacher's own plans from the previous school year. Teachers can also attach documents to lesson plans and display multiple weeks at the same time. Recurring plans are for lessons that repeat from week to week. 12. Grading - Entering Grades: Adding assignments and grades are easy on the grading page. 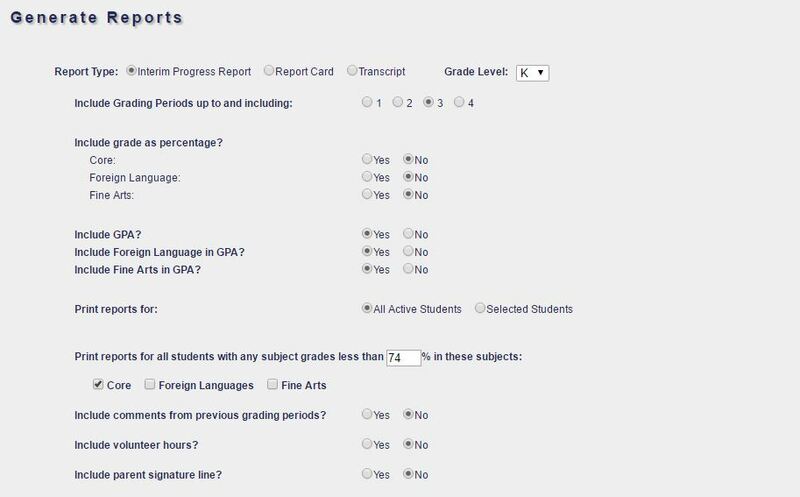 Average percentages and letter grades are instantly updated and saved as grades are entered. See the last grading period grades alongside for quick reference. Change the possible score on an existing assignment and the students' grades for that assignment are automatically prorated. This saves the teachers time when converting to a percentage score. Grades are backed up nightly, and teachers can restore grades from backups for individual classes in case of errors. 13. Grading - Averages: Assignment and test averages are tabulated as grades are entered, as are overall classes averages and letter grades per grading period. 14. Grading - Comments: Unlike other grading applications, student comments can be entered on the same page as the grades. 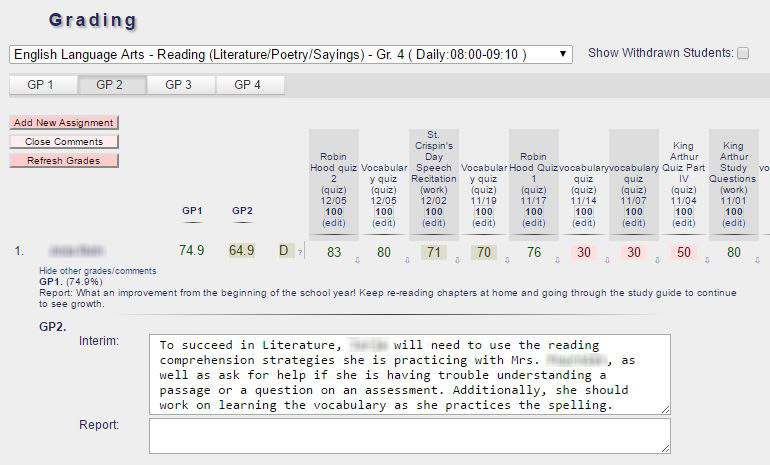 This allows teachers to refer to a student's performance while typing. 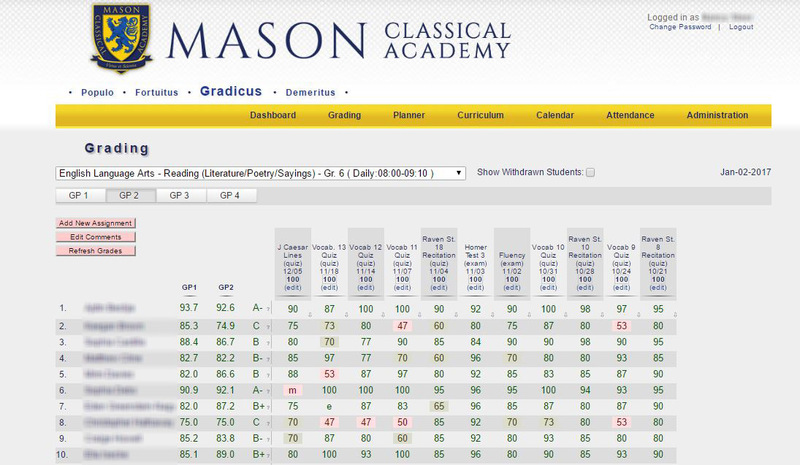 You can also view grades and comments from previous grading periods by clicking on the toggle. 15. Grading - Student Report: A comprehensive report can be viewed for each student by teachers and administrators. 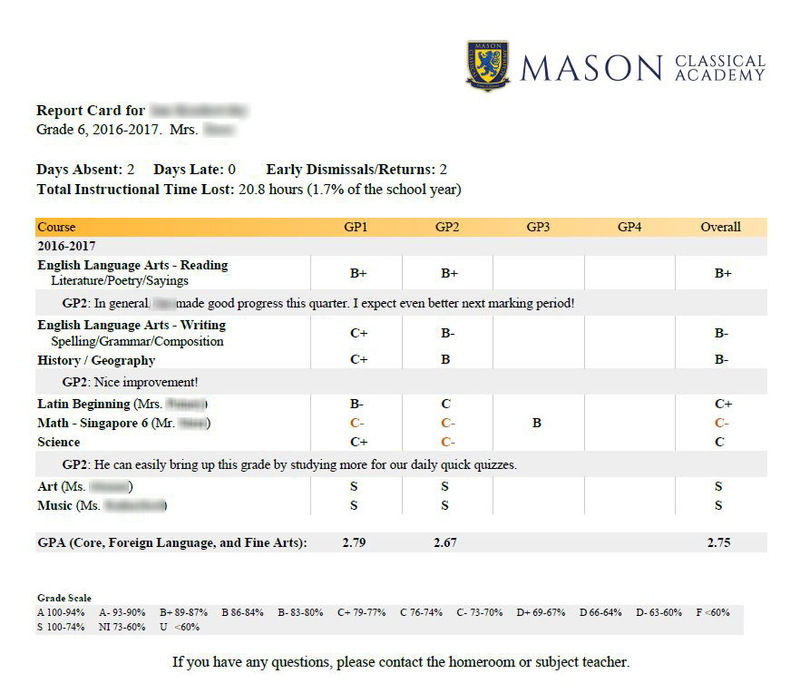 This shows the student's current and past grades, teacher comments, and a listing of tests and assignments, broken down by grade weighting category. How the final grades are calculated with the weighting categories can be viewed with a click. This report is available to parents for their own children through the Gradicus Parent Portal. 16. Reporting: Generate Interim Reports, Report Cards, and Transcripts from the same page. Multiple options are available to be able to get exactly what you need. Reports are created as PDF files that you can print and store. 17. Report Cards: Report cards are customized with your logo. Failing and low grades are highlighted in different colors. 18. Parent Portal: The Gradicus Parent Portal allows parents to access much of the available information about their own children, including grades, assignment and test scores, schedules, attendance history, discipline history (demerits), subject curricula, as well as enter volunteer hours and view their volunteering history. Parents can set or reset their own passwords, minimizing support calls/email to the school. Optionally, the Parent Portal can generate funds for the school by allowing parents to promote their business or send messages of support to other families in your school community. This feature alone can potentially pay for your SchoolClassics.org subscription and more! 19. Student Lists: Populo maintains the student database. 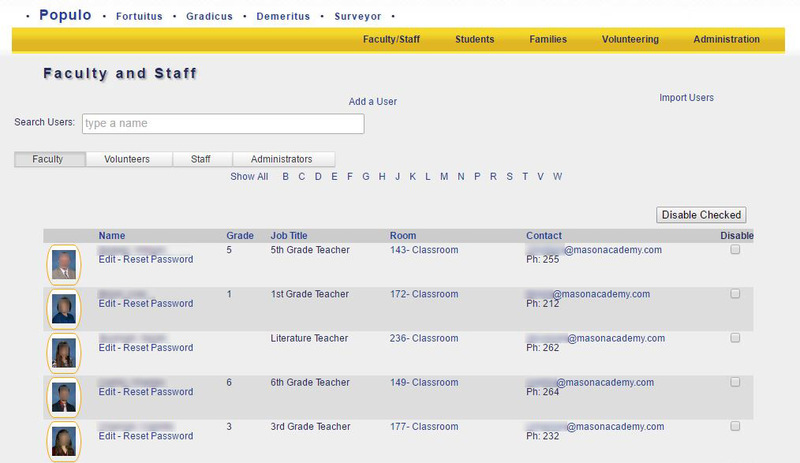 Student lists are sorted in multiple ways, or you can search for individual students. Get quick access to more information about each student through convenient links. 20. Family Lists: The family page of Populo contains quick reference to immediate family, emergency contacts, and pickup lists. Hovering over and clicking on links provides contact information. Primary contacts are highlighted in red. From here, you can generate signs to the families to display in carline. There is also an "Afterschool" module which highlights the family pickup lists and the students' after-school activities. 21. Faculty and Staff: Faculty and staff are also maintained in the databases of Populo. 22. Issue Demerits: Your school may choose to use the Demeritus system for tracking discipline. Demerits for rule infractions can be entered on a PC, tablet, or phone. Simply select the student and the infraction, add a brief description, and parents are instantly notified by email. 23. Demerit History: View student demerit history. Sort by the number of demerits to identify those students who need interventions. Click on a student's history to see if their behavior has been improving over time. 24. Detentions: Demeritus can be set to automatically issue detentions. Outstanding detentions are listed to aid in followup. 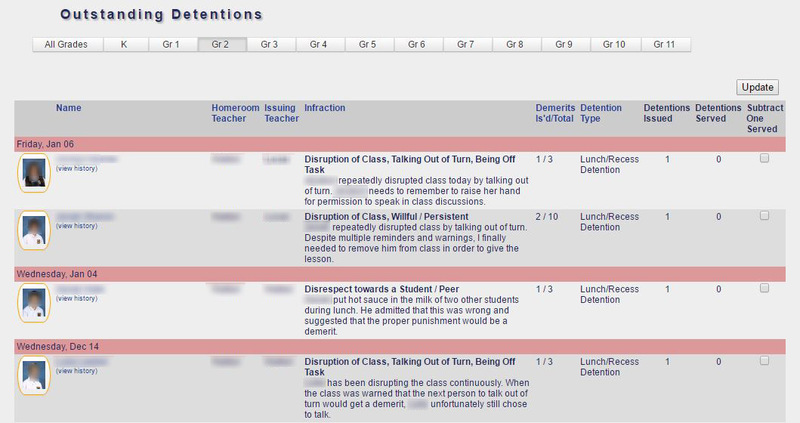 Outstanding detentions are also listed on the homeroom teacher's Gradicus dashboard page. 25. IT Requests: Faculty and staff can make IT requests through Fortuitus. Notifications are made instantly by email and text to the IT technicians. This page tracks their IT requests and allows them to update the status and make notes about the repairs. A repair history is linked to each item of equipment for future reference. 26. IT Inventory: Fortuitus helps schools manage their technology inventory. Multiple report formats allow for quick tallies of the numbers and value of equipment, as well as track their location and repair history. For your tech department, this is a convenient and secure location to store information such as serial numbers, login information, MAC addresses, and static IP addresses. 27. 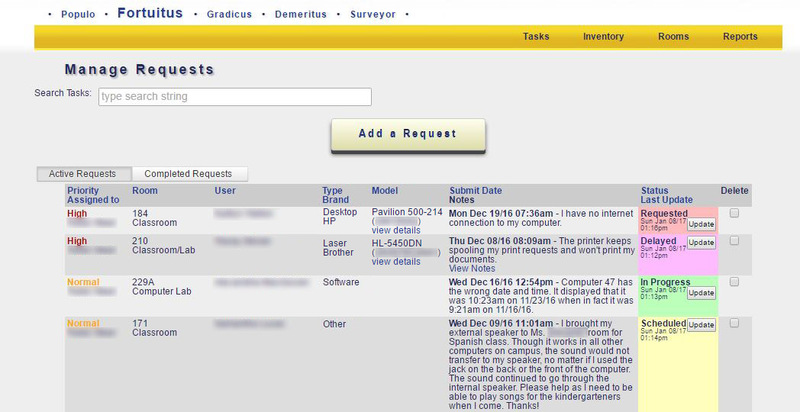 Survey Dashboard: Surveyor is designed to allow schools to gather information from their parents and staff. From the dashboard, surveys are created, edited, sent, and reviewed. 28. Survey Questions: Multiple question formats are available for scaled or textual responses. 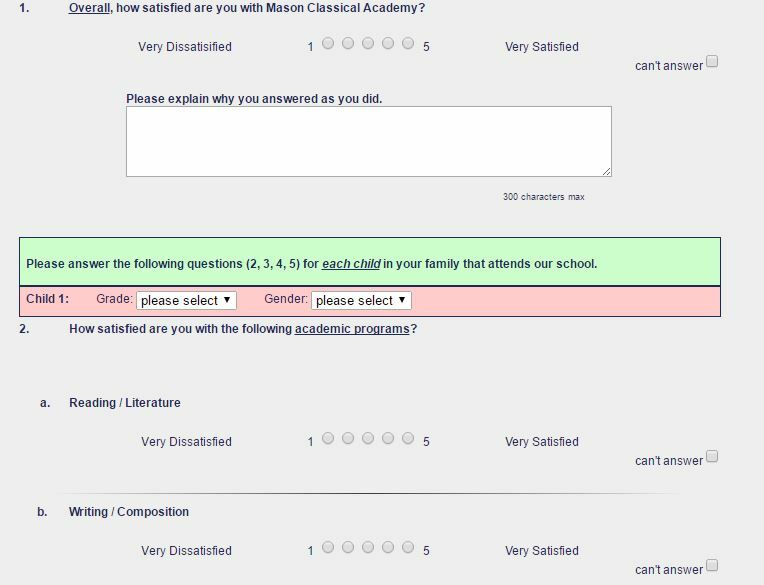 Optionally, statistics can be gathered by grade levels and gender. 29. Survey Responses: The anonymous survey responses are displayed graphically along with comments, and they can be viewed as an aggregate or by individually surveys. Results can be exported to PDF files for inclusion in reports.